Austin Healey, also known as the Leicester Lip, was a hugely versatile player, gaining international caps for England at scrum-half, fly-half and wing. Healey began his career with Orrell and Waterloo at wing or outside centre before switching to scrum-half when he signed for Leicester Tigers in 1996. It was this admirable versatility that proved to be Healey's greatest success and disadvantage in the game leading to him often, unfairly, being labelled as a "jack of all trades, master of none". In reality Healey was at times a fiercely intelligent scrum-half, full of snap and niggle and always aware of the chance for a sniping break. On the wing, his pace and tactical awareness allowed him opportunities at club and international level following the arrival of Fijian Waisale Serevi at Leicester. His desire to play at fly-half was granted at Leicester at the expense of Andy Goode, but Healey never reached the heights expected of him in the position. Indeed, he only won a single England cap at 10. Healey was an often outspoken member of the rugby fraternity, having spats with coaches Graham Henry, Andy Robinson and Pat Howard during his eventful career. He received his full England debut against Ireland in the 1997 Five Nations, and went on to amass 51 England caps. During his career he was a Lions tourist in 1997 on the victorious tour of South Africa and again in 2001 during the series loss to Australia. His only Test caps came as a replacement in the second and third Tests in 1997. 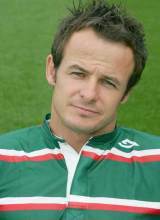 Healey's finest moments on a rugby pitch came in the green and red of Leicester however. In the 2001 an 2002 Heineken Cup finals Healey was instrumental in bringing the silverware to Welford Road. He provided the break that led to the winning score against Stade Francais in 2001, and he scored the decisive try himself against Munster in 2002. Following the high of the 2002 Heineken Cup win, it was back down to earth when Healey was left out of England's World Cup-winning squad in 2003. This event would gnaw at Healey to the end of his career, and he never played for England again following the World Cup warm-up with France in August 2003. His retirement came at the end of the 2005-06 season following several damaging injuries. Healey then worked for Credit Suisse and served as an analyst for the BBC and Sky. In 2008 Healey took part in the sixth series of Strictly Come Dancing, following in the footsteps of Matt Dawson and Kenny Logan. In 2010, Healey was confirmed as ESPN's lead analyst prior to the UK channel's first season of Aviva Premiership rugby.